Super strong, prevents the base of your shed or Summerhouse getting wet and cheaper than concrete! There really are no downsides to this product. We have been using Probase with customer log cabins, Summerhouses and Sheds for about 5 years. They are superb and much better than traditional concrete bases as they allow water that runs down the sides of the timber building to soak away into the ground rather than run under the building and soak into the timber base bearers of your shed or Summerhouse. Many sheds rot from the bottom up and this is caused because the base bearers are allowed to be wet over a long period. Probase also ensures there is an airflow to the base and so keeps it dry. 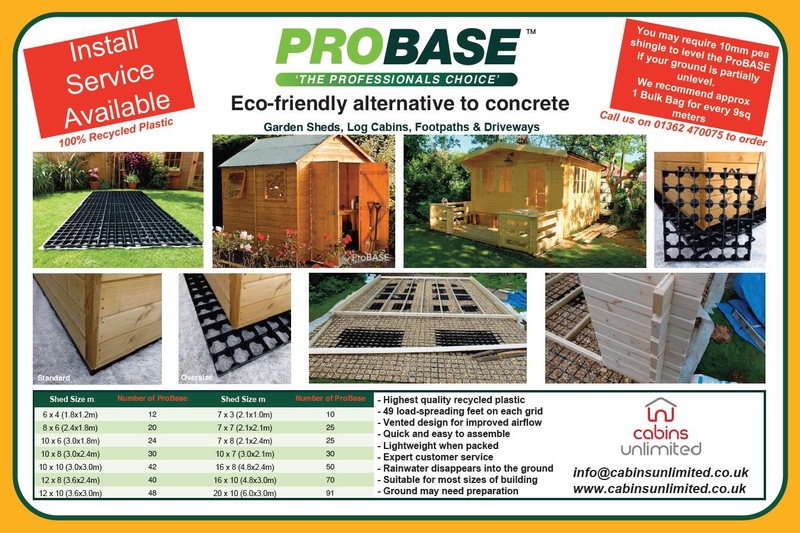 Probase is also very strong and easy to level and we have also used it on driveways and footpaths and even to support hot tubs. We recently have been using it as a base for air conditioning units to stand on.